This is a movie that will restore your faith in the power of movies. The story is true, the dialog is often witty, the plot moves effortlessly between the past and present. The staging is impressive; the lighting adds texture; the editing builds tension. And there is a sense of balance here – between small moments in private — and large events on a grand stage; between the memories of an older generation and the awakening of the young. This is the story of a massive wrong being contested on a personal level. “Artwork stolen by the Nazis,” Ronald (Miles) tells Maria (Mirren), “are the last prisoners of World War II.” Estimates say 100,000 pieces of art are still missing; Maria wants to retrieve just one painting. 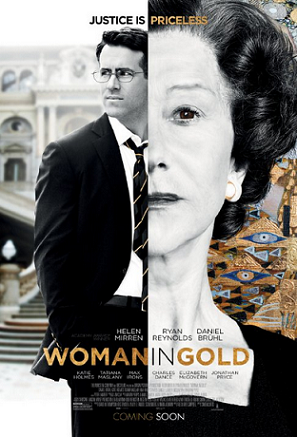 Called “Woman in Gold,” it hangs in the Belvedere Museum in Vienna. Based on information in old letters from her sister – and a new policy from the Austrian government — Maria believes it’s possible to get her family heirloom back. This is as much Maria’s story as it is the story of a painting and in telling it, director Simon Curtis gets emotionally-charged performances from his unknown German cast and creates scenes that will tear out your heart through your tear ducts. Sometimes sentimental, often stirring, the story moves forward with a quiet sense of indignation: what has been stolen simply must be returned. It’s a movie that belongs to its two leads –Helen Mirren and Ryan Reynolds and their chemistry works. He continues to broaden and deepen as an actor; she is a wry and whirling dynamo. With a sideways glance, she escorts us back to her yesterdays; with a dry comment, she dismisses a roomful of lawyers; with a shrug of her shoulders, she takes command of a scene. She makes Maria pushy and pragmatic, full of pain and pride and persistence. “She came to America in search of peace,” Randy tells the court, “let’s also give her justice.” We know it’s a long shot, but from the beginning, we’re on her side.